New… Sunday Brunch! Oh, yeah! Visit our Brunch Menu page. Sabores Boutique Café, a Restaurant serving authentic Puerto Rican fusion food, coffee and pastries in Mableton. Sabores @ O.M. Collective Cuisine Catering is a new alternative to the Mableton area where our goal is to bring to the table exciting Puerto Rican flavors, and food made from scratch every day using the best ingredients available. We bake fresh pastries every morning, serve espresso drinks that are ground-to-order and all meals are prepared on a per-order basis. We are a small family owned Puerto Rican Café & Restaurant where we love what we do and especially love bringing people together in a neighborhood atmosphere to enjoy our varied menus with everything from soups, salads and Paninis to our very flavorful authentic, bold flavored Puerto Rican food. Once a month, since we opened in December 2017, we roast a whole pig. It's a great time to come out and have a traditional meal with some great people in a fun environment. People come from all over Georgia to enjoy this day. We would love your support to keep the tradition going. We will also announce the date on the website and our social media as it comes close. Stay tuned to social media for daily specials. Facebook and Instagram links are on the bottom of the page. We hope you can stop by and enjoy our restaurant and food as much as we enjoy making it and bringing joy to your day. Thank you for checking out our page, please visit our menu pages and enjoy! 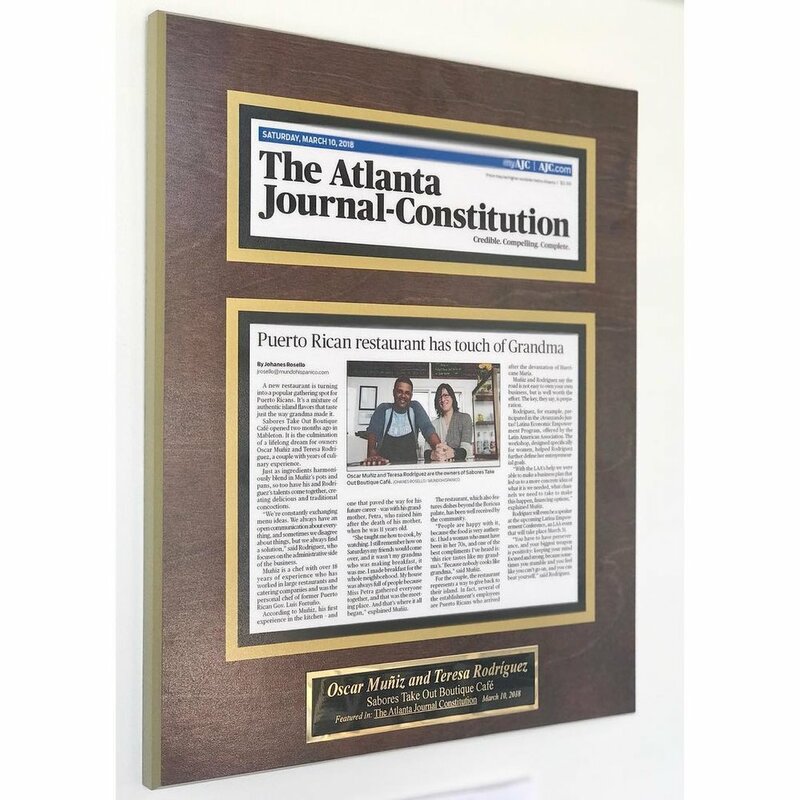 Sabores Boutique Cafe was featured in The AJC in March 2018. Please visit our Parent Company's Website O.M. Collective Cuisine for all your catering needs.